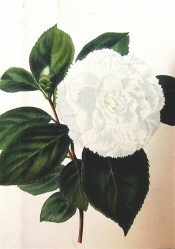 A cultivar of Camellia japonica L. Similar to ‘Alba Plena’, which see, with medium, formal double white flowers, with fringe-margined petals. [RHSE, Don, ICR]. ‘The leaves exactly like those of the C. alba; but a less vigorous shrub; bud large, rounded, scales of a dark yellow; flower three and a half inches in diameter, full, depressed; petals gracefully imbricated, dentated or mucronated at their superior limb.-Superb.’ [Berlèse Monography p.48/1838]. Introduced to England in 1816 by Colville’s of Chelsea. [Don]. ‘There is an uncommon degree of delicacy and beauty in the flower. The original double white camellia is doubtless a most exquisite plant which scarcely anything can surpass, yet the one now before us, from the firmly fringed edges of the petals, has a novel character peculiarly its own.’ [LBC no.1103/1826]. Loddiges’ Nursery purchased most of Colville’s stock on the closure of that nursery. Listed in the 1850 and 1857 catalogues [T.224/1850]. Fimbriata is listed in both the 1830 and 1836 editions of Loddiges’ Nursery catalogue, copies of which are held at Camden Park [CPA]. In the 1830 edition it is marked with an ‘o’, indicating newly introduced to the Colony, and in the 1836 edition it is marked with both an ‘x’, indicating common before or long introduced, and a ‘c’, indicating grown at Camden. Interestingly it was also ticked and marked with ‘c o’ in an article by ‘G.A.L’ in a copy of the Horticultural Register once in William Macarthur’s possession, although this book originally belonged to James Bowman and only later by Macarthur. [HR p.634/1832]. 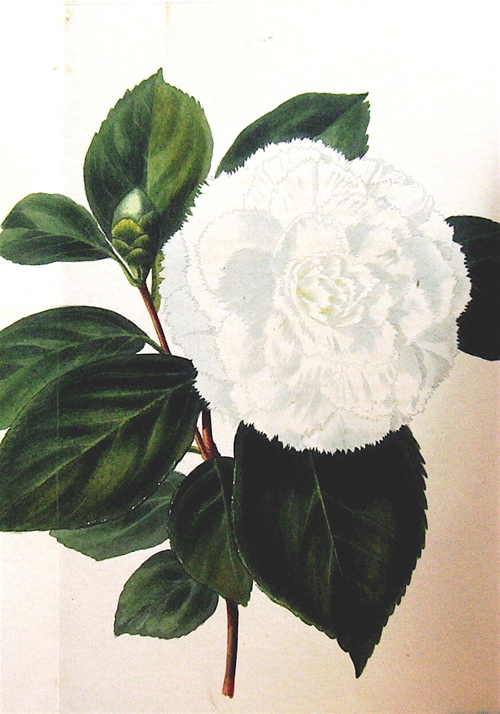 ‘Fimbriata’ was among the camellias positively identified at Camden Park by Walter Hazlewood in the 1930’s. He gave no description. [TJSC]. It may have been obtained from Loddiges’ Nursery as it was included among desiderata in a letter dated 6th January 1845 [MP A2933-2, p.28] and again on 16th April 1846 [MP A2933-1, p.147]. A very large specimen of ‘Fimbriata’, more than 100 years old survives at ‘Aln Bank’ on the South Coast of NSW.